A pipe bomb has exploded at a car dealership in Northern Ireland, police said. The device detonated ten minutes after it was left by a person carrying a backpack shortly after midnight on Sunday. Four cars in the yard in Cathedral Road, Armagh, were damaged. 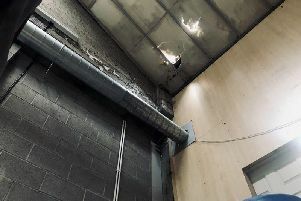 A number of homes were evacuated and families and businesses suffered extreme disruption, SDLP Stormont Assembly candidate Justin McNulty said. Det Insp Tate said officers received a report of damage just after 7.20am. “On further investigation it was thought that the damage was caused by an explosion.